Дополнительная информация: Satin-finish stainless steel. 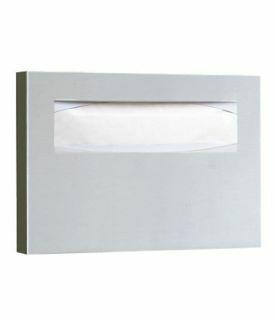 Dispenses 250 single- or half-fold toilet seat covers. Fills from bottom. Unit 15 3⁄4" W, 11" H, 2" D (400 x 280 x 50mm). Allow 5" (125mm) minimum clearance from bottom of dispenser to top of any horizontal projection for filling dispenser from below unit.